It’s time for Halloween and what is Halloween with out some trick or treaters!! Help this group of trick or treating friends make their way through the maze and get to the candy! Click on image to view and print full size. Parents & teachers – feel free to print this activity out and include it in your Halloween goody bags and party activities! 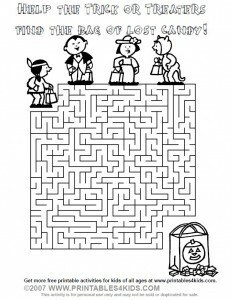 Or download the Trick or Treat printable maze for kids as a PDF file. CostumeCraze.com – $2.99 Flat Rate Shipping without limits or FREE shipping when you spend $50 or more. SmileMakers! 10% off and free shipping. Enter SOURCE code SCARY at checkout to receive this special offer. Offer expires 10/31/2009. Get 20% off 1 item at SpiritHalloween when you use the coupon code SPAF20! Hurry, this offer ends 10/29/09! Free Expedited Ground Shipping on all orders of $70 or more at CostumeDiscounters.com! Does this Trick or Treat, Halloween word search have the word “pirate” in it? We can’t find it. A frustrated teacher and her 30 students. Hi! Love all your ideas and pages for the holidays. Can you email me the answers to the Halloween costume unscramble the words sheet. I want to make sure I have the correct answers before doing them with my class. Thank you so much! Hello, Where do I find the answers to the Halloween Costume Parade unscramble? Is the word pirate in this wordsearch. My students as well ,can not find it either. This question is the same as one that was asked on the 17th from a frustrated teacher and there is no response. Cheryl – the old word search was missing pirate. I have redone it to include the word pirate, but you will need to download the new one.